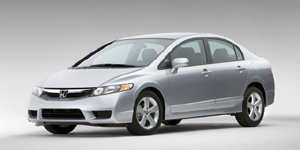 The Honda Civic receives an exterior and interior makeover for 2009. Engines and trims generally carry over from 2008, except for the Mugen Si sedan. A new DX-VP trim on sedan models includes air conditioning and an audio system, while a new LX-S trim upgrades LX sedans with alloy wheels, exclusive black seat-upholstery, a leather-wrapped steering-wheel, a rear spoiler, and a chrome exhaust finisher.